1. 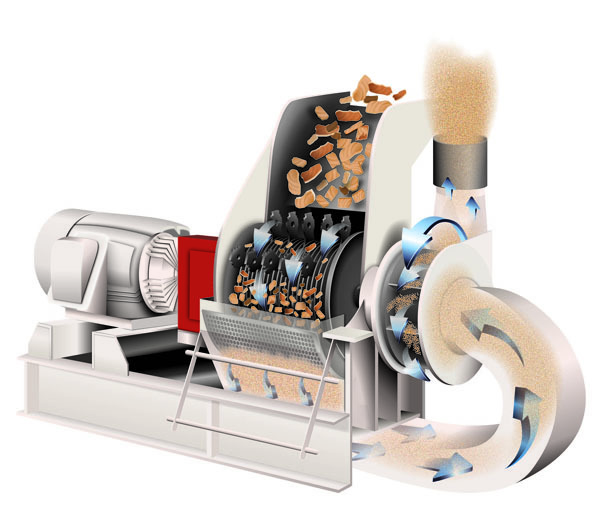 Material is fed into the mill's chamber typically by gravity. 2. The material is struck by ganged hammers (rectangular pieces of hardened steel) which are attached to a shaft which rotates at high speed inside the chamber. The material is crushed or shattered by the repeated hammer impacts, collisions with the walls of the grinding chamber, as well as particle on particle impacts. 3. Perforated metal screens, or bar grates covering the discharge opening of the mill retains coarse materials for further grinding while allowing the properly sized materials to pass as finished product. Varying the screen size, shaft speed, or hammer configuration can dramatically alter the finished size of the product being ground. Faster speed, a smaller screen, and more hammers result in a finer end product. Each component can be changed individually or in any combination to produce the precise grind required. All of this is determined by taking advantage of our free of charge test grinding service.